Sofonisba Anguissola, "the First Great Woman Artist of the Renaissance"
Born in Cremona, Italy, probably about 1532, Sofonisba Anguissola was the eldest of seven children--six of them daughters--born to Amilcare Anguissola and his wife, Bianca Ponzone, both of whom were members of noble families. Amilcare made sure that his daughters received an excellent humanist education, but he also recognized his daughters' creative gifts. Unusual for the period, when women artists followed their fathers or brothers into the studio, Sofonisba and her sister Elena were apprenticed to a local painter, Bernardino Campi, in 1546. As Germaine Greer notes, when he sent his daughters to study painting, Amilcare Anguissola "was setting an extraordinary precedent." While Sofonisba may have been recognized as a "prodigy," Greer notes that her father may also have had other motives in providing his daughter with training as a painter: he had six daughters for whom he would have to provide dowries. His son did not study painting, but his daughters "were encouraged to develop as many accomplishments as they could," including painting. The arrangement with Campi was not a usual apprenticeship, since he had no other students and the two Anguissola "apprentices" were "treated as paying guests in the household." In any case, as Greer concludes, the investment in Sofonisba Anguissola "was a wise one." She was not only able to earn a good living, but she also was able to teach her younger sisters, or at least three of them, to paint. * And after three years with Campi, Sofonisba continued her training with another Cremonese, Bernardino Galli. In 1552, Sofonisba traveled to Rome, where she was introduced to Michelangelo. Encouraged by Michelangelo, she was also informally advised by him--he sent her sketches to draw and offered his critiques and advice. As a woman, Anguissola could not study anatomy or draw from life; instead, she focused on portraits which, as Greer clarifies, were deemed appropriate for women because "portrait painting did not imply any unbecoming breadth of experience." 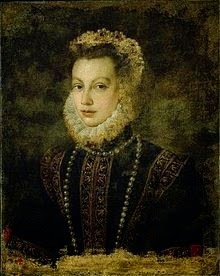 By 1558, she had gained enough of a reputation that she was in Milan to paint the duke of Alba--he, in turn, recommended her to Philip II of Spain. In 1559, Anguissola traveled to Madrid. She spent nearly twenty years as court painter and lady-in-waiting. There she also taught the Spanish king's third wife, Elisabeth of Valois, who was an amateur painter. Among the portraits Anguissola painted was one of the king's sister and regent, Joanna of Castile, whom we have already met. And she would also tutor Elisabeth of Valois' daughter, Isabel Clara Eugenia, who would be yet another Habsburg women to serve her family as regent. Sources disagree about whether she relocated to Sicily or whether she remained in Madrid. 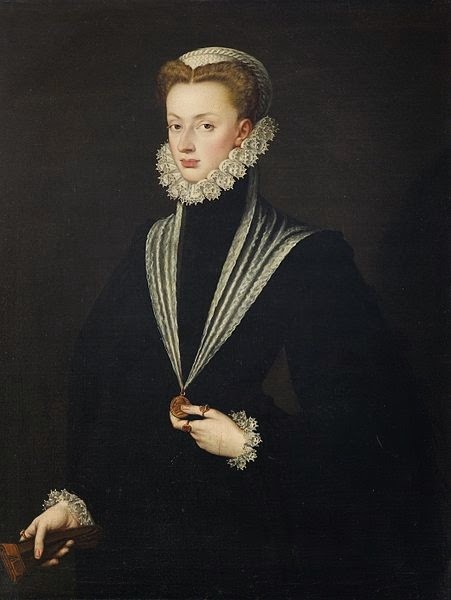 In any case, after Moncada's death in 1579, she remarried in 1580, this time not to a husband of someone else's choice, but to a man she chose for herself, Orazio Lomellino, a Genoese nobleman. From 1584 until about 1616 or 1620, she lived in Genoa. By 1624 the couple was in Palermo, where, on 12 July, Anguissola was visited by the Flemish painter Anthony Van Dyck. He sketched a portrait of her (he thought she was ninety-six years old at the time [she was likely about ninety-two]), and believed that she was nearly blind (she suffered from cataracts). 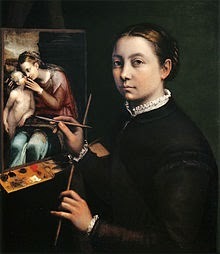 The entry on Sofonisba Anguissola in the National Museum of Women in the Arts Database notes that she is "arguably the first known woman artist to achieve international fame." Ilya Sandra Perlingieri's beautiful Sofonisba Anguissola: The First Great Woman Artist of the Renaissance is out of print, but you can still find used copies. I have used Germaine Greer's The Obstacle Race: The Fortunes of Women Painters and Their Work here (and elsewhere, when talking about women artists). *Elena Anguissola ended her painting career, begun with her sister when the two apprenticed with Campi, when she became a nun. In addition to Sofonisba and Elena, Lucia, Europa, and Anna Maria also became painters--only Minerva did not. Europa and Anna Maria married and gave up painting. Lucia, born in 1536 or 1538, died before 1568. An early biographer thought that, had she lived, Lucia Anguissola would have become a better artist than Sofonisba.